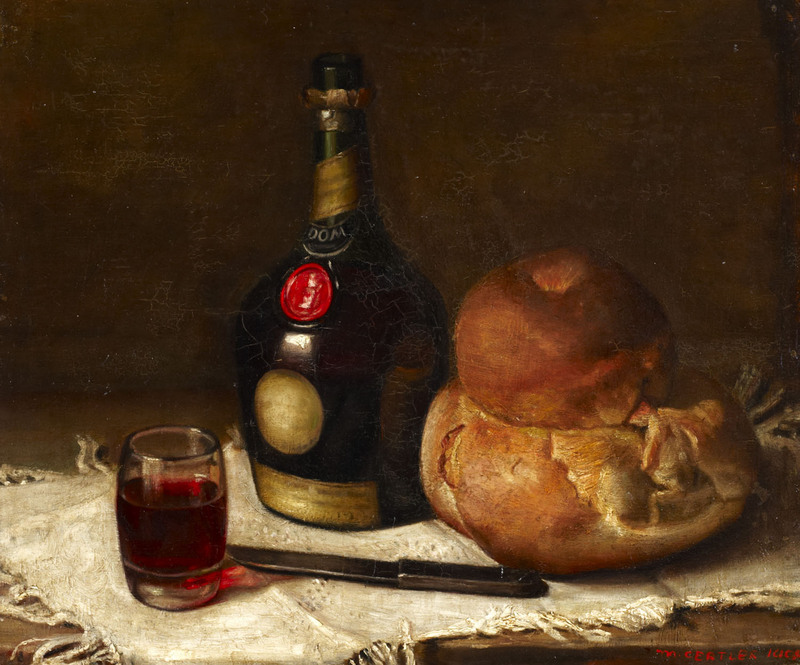 Perhaps originally inspired by a Friday-night eve of Sabbath supper, this early still-life was probably created towards the end of Gertler’s brief training at the Regent Street Polytechnic (1906-8), before he began at the Slade School of Art. It relates closely to the Study of a Still Life in the National Gallery, signed ‘Chardin. 1754’, but now recognised as by a nineteenth-century imitator. It was painted at a time when Gertler greatly admired the old masters of Dutch realism, and its later followers including Jean-Simeon Chardin, and began to ‘haunt’ the rooms of the National Gallery, crafting his own pictures in their image. These simple kitchen scenes appealed to Gertler because of their familiarity. These were the objects he found in his mother’s kitchen (where he had his first studio) and his close relationship with his mother is also reflected in his choice of everyday subject matter. Gertler later recalled the painting of these ‘simple and loveable little still lives’ in his mother’s kitchen as among his finest moments. The round loaf depicted resembles a Challah loaf, now closely associated with the festival of Rosh Hashana (the Jewish New Year), with the spiral rounds thought to symbolise the continuity of creation.